While most Goat Milk Stuff customers select from our wide array of naturally-scented soaps, the popularity of the unscented soaps has grown consistently. Goat Milk Stuff has added a “Sensitive Skin Pack” containing unscented all-natural, chemical-free goat milk soap, lotion, lip balm and laundry soap for people with problem or sensitive skin. This gift set augments Goat Milk Stuff’s nationally-acclaimed array of scented and unscented goat milk soaps and is available online at http://www.GoatMilkStuff.com. The Sensitive Skin Pack costs $20 and contains a 5-ounce bar of unscented Purity Soap, an unscented Lotion Stick, an unscented Lip Balm and a trial-size package of Laundry Soap. 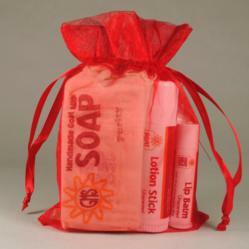 This helpful set is presented in an organza bag and makes a wonderful starter package of Goat Milk Stuff’s products for yourself and also serves as an ideal gift to pamper someone special. 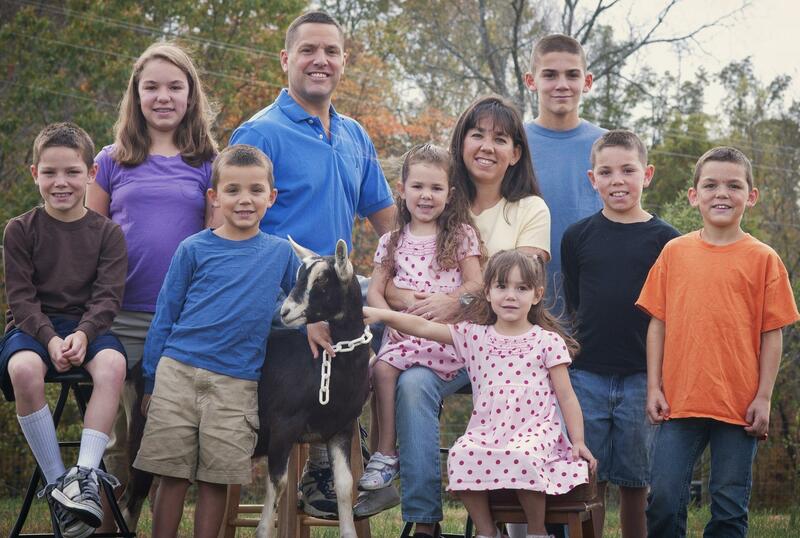 A mom of 8, PJ started making the soaps for her young children in 2006 at her small 3-acre Indiana goat farm. She soon realized that others could benefit from the pampering qualities of goat milk soap products as well, so she founded Goat Milk Stuff. The thriving success of Goat Milk Stuff now has the family making its soaps and lotions on its new 36-acre farm, with a vastly expanded soap making room. Goat Milk Stuff’s high-quality, affordable soaps and other products have been featured nationally by CBS-TV’s national hit show, The Doctors, on NBC-TV’s famed Today Show, Oprah Magazine and a variety of newspapers, magazines, TV, radio and Internet reports. Goat Milk Stuff soaps, lotions and other products are all-natural and chemical-free and made by the Jonas family of PJ and Jim and their children, aged 5 to 16, each of whom helps in an age-appropriate way to bring the best quality soaps to their growing number of customers. Online at http://www.GoatMilkStuff.com, the Scottsburg, Indiana, company makes and markets all-natural Goat Milk Stuff™ products including goat milk soaps, lip balms, lotions, bath bombs, laundry soap, soy candles and more. For media contact Brian Dobson at DobsonPR.com or BD (at) DobsonPR.com. 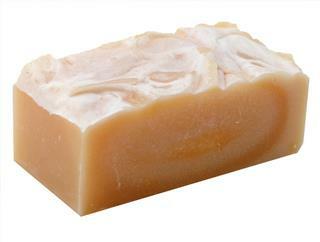 Purity, the popular unscented soap, is one of many wonderful goat milk soaps offered online at www.GoatMilkStuff.com. 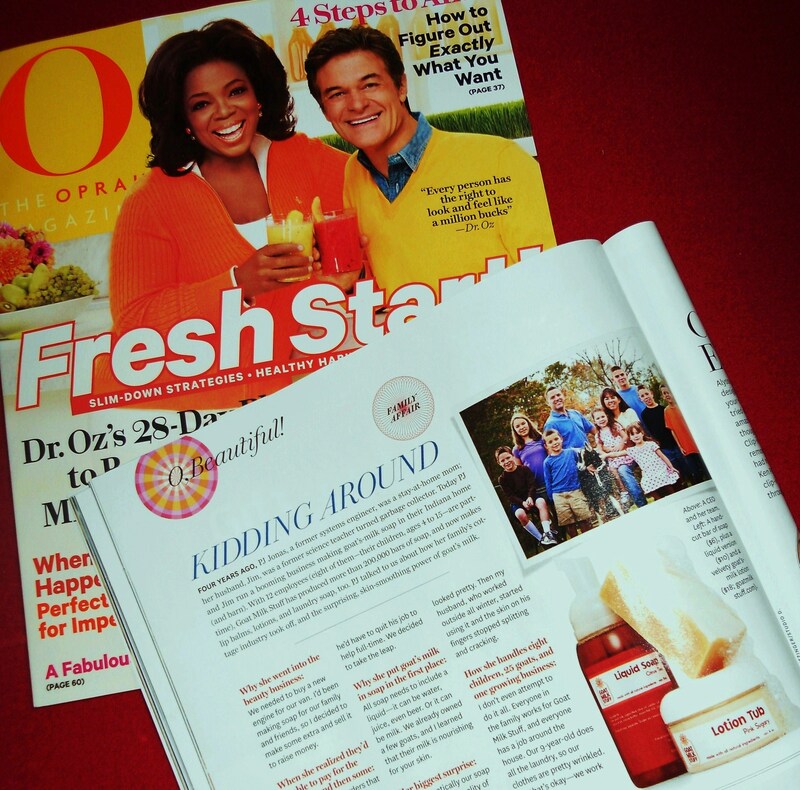 Oprah Magazine featured Goat Milk Stuff's natural goat milk soaps & lotions. PJ and Jim Jonas and their 8 children work to make the finest goat milk soaps, lotions and other Goat Milk Stuff products on their Indiana farm.